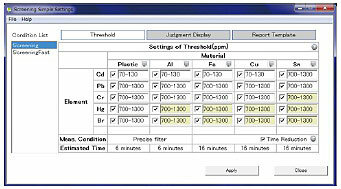 The optional screening analysis kits allow even beginners to start RoHS, halogen, or antimony screening analysis right from the day of purchase. Simply mount the sample, select the analysis conditions, enter the sample name, and wait for the results. 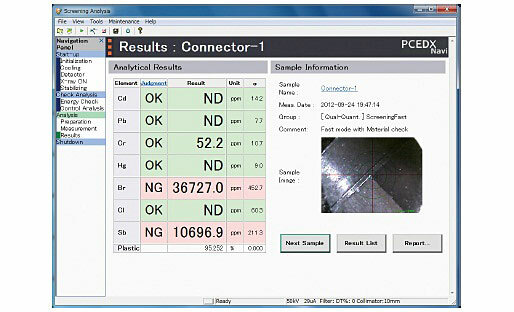 The analysis results are displayed with a pass/fail evaluation after just a few minutes. 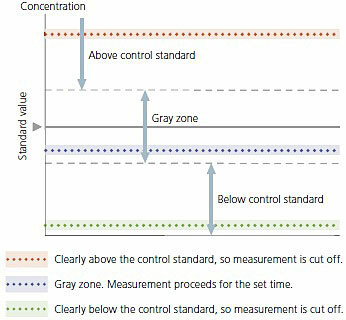 Internal calibration curves are provided for many materials, making it unnecessary to provide a large number of standard samples. The software automatically selects the best calibration curve for the material, freeing the user from the need to select analysis conditions. As an incorrect calibration curve selection can result in large error in the quantitation results, this function contributes to improved data reliability. The fluorescent X-ray and scattered X-ray intensities are compared for each element (BG internal standard method) to eliminate the effects of the sample shape and thickness in the quantitation values. This function automatically switches to the next analysis channel if a controlled substance clearly has a high or low concentration, making evaluation possible while measurement is underway. This achieves more efficient screening analysis. 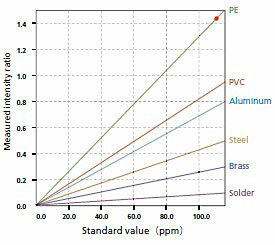 A threshold value can be set for each material and element. The screening evaluation method changes according to how the threshold values are set. Character strings can be set for display in the analysis results when the threshold value is not exceeded, in the gray zone, and when the threshold value is exceeded. Set the report style from among the templates supplied as standard. Three screening Analysis kits are available to suit dif ferent applications. Kit for screening cadmium, lead, mercury, chromium, and bromine. Polyethylene samples containing these five elements are supplied in the kit for instrument management. In addition to cadmium, lead, mercury, chromium, and bromine, this kit also supports the screening of chlorine in plastics. Polyethylene samples containing these six elements are supplied in the kit for instrument management. In addition to cadmium, lead, mercury, chromium, and bromine, this kit also supports the screening of chlorine and antimony in plastics. Polyethylene samples containing these seven elements are supplied in the kit for instrument management.